The method I used yesterday may surprise you. It surprised me. I cooked 3 vegetables I had on hand without oil and in the oven. You know what? They were not withered and dry. I was very surprised. Throughout the process of prepping the ingredients and preheating the oven you don’t know how many times I was about to give in and just grab the olive oil or coconut oil and add a little which can sometimes turn into several tablespoons. Instead I stood my ground determined to experiment and try something different. It’s not that I’m against oil but I do think I can eat way too much of it and way more than what I actually need. So, I’m consciously trying to cut back and stick with non-overt fats like nuts, nut butters, and avocados when I’m eating. You’ll see I enjoyed a whole small (really small) avocado along with my veggies as well as sauerkraut and a locally made everything bagel. Yum! All you need is a sheet of parchment paper – to ensure nothing will stick – and a cookie sheet. 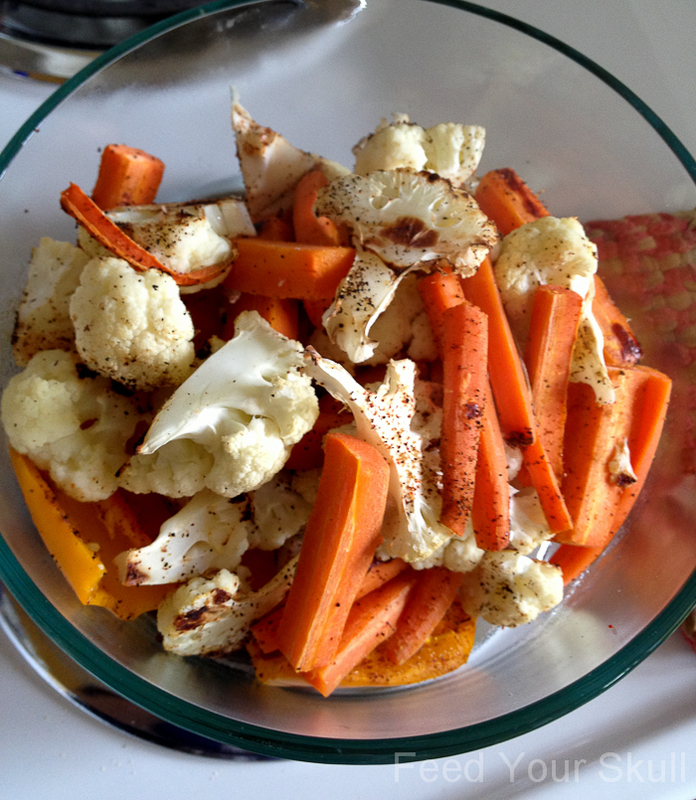 I used carrots, cauliflower, and mini red and yellow peppers in this run. These 3 seem to have a good moisture balance which might’ve made them ideal for roasting as they sort of end up dry steaming. I honestly think this method could work for most if not all vegetables but I haven’t done extensive rounds as this is my first go. I think eggplant would be great but it would be better to cut in larger cubes vs mandolined rounds – these might end up more like chips. I would like to give broccoli a try but I feel like that over cauliflower for some reason would dry out, so I was wondering if tossing the veg in a colander and rinsing them under running water would give enough moisture so that the ‘temperamental’ vegetables wouldn’t ever dry out. Anyway it’s a new-ish way to try at cooking your veg and it only takes 15 minutes at 350F. 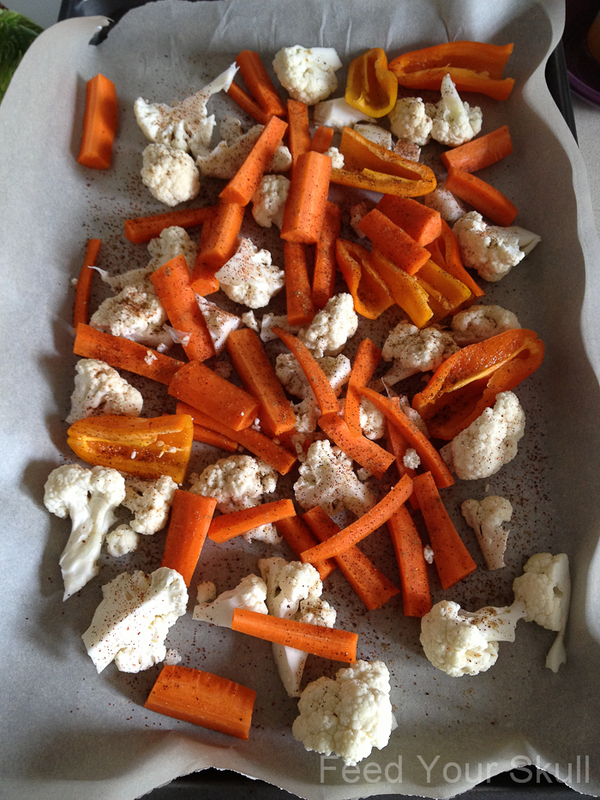 I placed prepped veggies on a parchment-lined cookie sheet and added a sprinkle of chili powder and cumin. They baked at 350F for 15 minutes. I then emptied them into a lidded bowl to toss with tamari and lemon juice adding nutritional yeast when I was done. Swoon worthy. 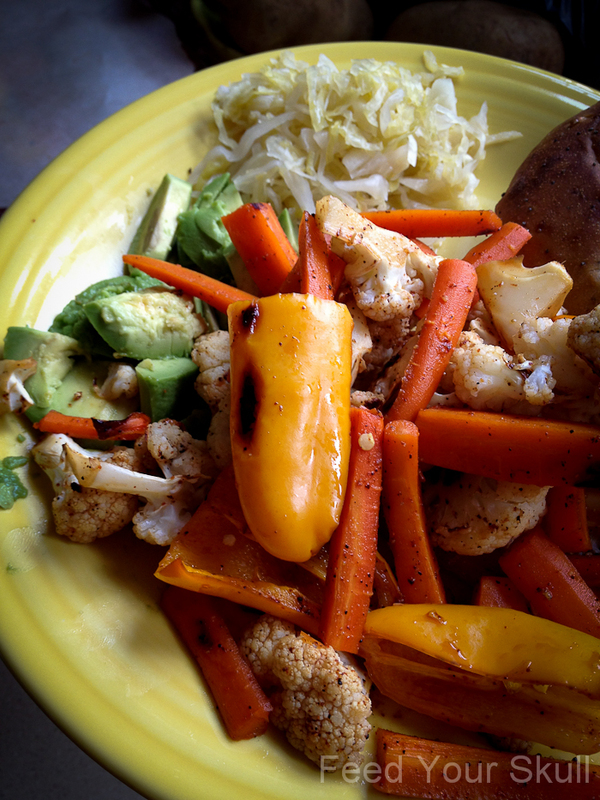 Here is heaven served up with the delicious savory no oil roasted veggies, a side of avocado, sauerkraut and an Oregon made everything bagel. mmmm. Hi Big Thank You for posting this method of roasting veg w/o oil. This is the way to go as cooking with too much oil isn’t healthy even though our minds may think it tastes better. We need to reeducate our minds and our taste buds. Our bodies will thank us in the longterm. Grateful to this website for demonstrating that you can roast just about anything without oil. I roasted broccoli, okra, and sliced potatoes in the oven without oil or any no-stick spray. They stuck a little to the aluminum foil but a spatula easily removed them when I lifted each end and scraped downward. And no, it wasn’t mushy, but yummy, firm and tasty once I added the soy sauce. I used natural bbq sauce instead of lemon juice and included roasted garlic before they went in the oven. Deliciously repeatable! Mel, a terrific tip!! Thanks!!! !